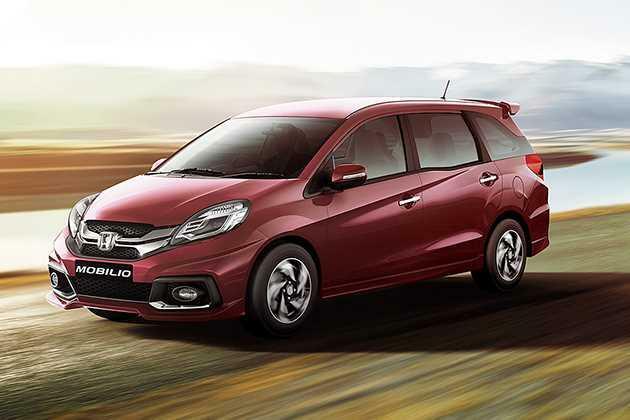 One of the largest car makers in the country, HCIL has added three new 'Option' variants to their recently launched MPV, Mobilio. These trims have been fitted with a few additional features like rear view parking camera and an AVN (audio video navigation), which has a 15.7cms touchscreen display with maps and satellite based voice guided navigation. Its internal section will also feature woody internal panel on the dashboard and door armrest for further enhancing the look of its cabin. In terms of exteriors, this variant has an aerodynamic body structure fitted with a lot of striking features. Some of these includes a bold radiator grille, body colored bumper, large windscreen and several other such aspects. The Honda Mobilio V Option i DTEC is their top end diesel trim, which is powered by a 1.5-litre engine. It has the ability to churn out a maximum power of 98.6bhp in combination with 200Nm of peak torque output. Its braking and suspension mechanism are quite efficient and keeps the vehicle well balanced at all times. This MPV is currently available in several exterior paint options, which includes Brilliant Gold, Alabaster Silver, Carnelian Red Pearl, Urban Titanium, Taffeta White and Majestic Blue metallic finish option. It is being offered with a standard warranty of 2-years or 40000 Kilometers, while it can be further extended at an additional cost. To begin with the side profile, it is neatly designed and comes with body colored door handles and ORVMs. These external mirrors are electrically adjustable and integrated with a side turn blinker. The flared up wheel arches are fitted with an elegant set of 15 inch alloy wheels, which further enhances the look of its sides. These rims are further covered with 185/65 R15 sized tubeless radial tyres. Its rear end is designed with a large windscreen, which has a defogger and a centrally located LED high mounted stop lamp. It also has a body colored bumper that houses a pair of reflectors, a curvy boot lid with variant badging and a radiant tail light cluster. The frontage has a slanting bonnet with a couple of visible character lines. The bold radiator grille is fitted with a thick chrome slat and it is embedded with a prominent company logo. This grille is flanked by a neatly carved headlight cluster, which is incorporated with halogen lamps and turn indicator. The bumper is painted in body color and it features a large air intake section for cooling the engine quickly. It is surrounded by a pair of bright fog lamps. The large windscreen is made of green tinted glass and it has a set of intermittent wipers as well. This Honda Mobilio V Option i DTEC variant has a spacious internal cabin with a lot of features. It is incorporated with comfortable seats, which provide ample leg space. These seats are covered with premium fabric upholstery. Its second row seats are foldable and sliding, while the third row seat has folding function only. The dual tone dashboard comes with wood inserts and it is equipped with a few features like a three spoke steering wheel with company's logo in the center, AC vents and a large glove box. The illuminated instrument panel houses a low fuel warning light, a tachometer, a digital clock, an electronic tripmeter, speedometer, fuel gauge, seat belt and door ajar warning notifications. This variant is bestowed with a number of utility based aspects, which includes cup and bottle holders, footrest, power steering with tilt adjustable function , four assist grips and all four power windows with driver side auto down function. It comes with a spacious (200 litre) boot compartment, which can be increased by folding third row seat. This variant is powered by a 1.5-litre i DTEC engine, which can displace 1498cc. It is integrated with 4-cylinders and 16-valves , using a DOHC (double overhead camshaft) based valve configuration. This diesel motor has the ability to churn out a maximum power of 98.6bhp in combination with 200Nm of peak torque output at just 1750rpm. It is incorporated with a direct injection fuel supply system, which helps in generating about 24.2 Kmpl on the highways and 18.3 Kmpl in the city traffic conditions. It is cleverly mated with a five speed manual transmission gear box, which allows the MPV to achieve a top speed in the range of 150 to 160 Kmph. At the same time, it can cross the speed barrier of 100 Kmph in about 13 to 15 seconds. The front wheels are equipped with a set of disc brakes, while its rear wheels get conventional drum brakes. It is further augmented by anti lock braking system along with electronic brake force distribution. On the other hand, the front axle is assembled with a McPherson strut, whereas the rear axle is fitted with torsion beam type of mechanism. This variant is blessed with an electronic power steering system, which is tilt adjustable. This steering wheel supports a minimum turning radius of 5.2 meters, which makes it convenient for handling. This trim has a new audio video navigation system with 15.7cm touchscreen display. It supports i-Pod connectivity, CD/DVD player, radio with AM/FM tuner, USB interface, Aux-in port along with Bluetooth connectivity . The multi-functional steering wheel is integrated with audio and call control buttons. It has an efficient air conditioning unit, which also has a heater and rear AC vents. Apart from these, it also has all four power windows with driver side auto down function, rear view parking camera, day/night internal rear view mirror, rear defogger, ECO lamp, a 12V power socket and sun visors with vanity mirror. This Honda Mobilio V Option i DTEC trim is equipped with a lot of protective features like 3-point ELR (emergency locking retractor) seat belts with pretensioner and load limiter, dual front airbags, central locking system, keyless entry, security alarm system, pedestrian protection, fog lamps, high mounted stop lamp and an engine immobilizer. This MPV has a rigid body structure with side impact beams that protect the passengers inside the cabin in case of any collision. 1. Audio video navigation system is a big plus point. 2. After sales service is quite satisfying. 2. A few more features can be added.